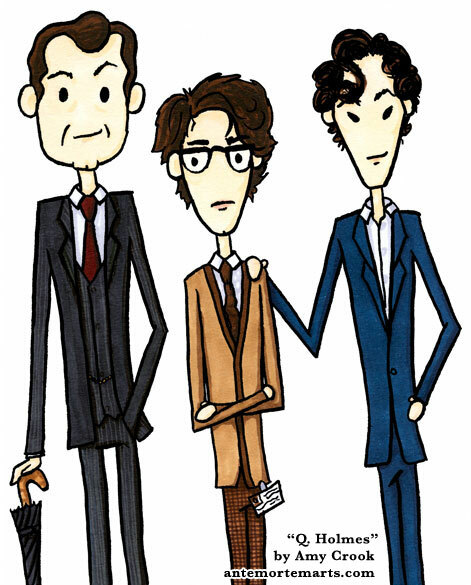 The second of the silly sketch prompts, proving my friends deserve me, is the crossover known as Bondlock, wherein Bond’s Q is the third Holmes brother. I imagine he’s making that face because his big brothers are giving him crap about his fashion sense, though honestly being related to those two is cause enough. 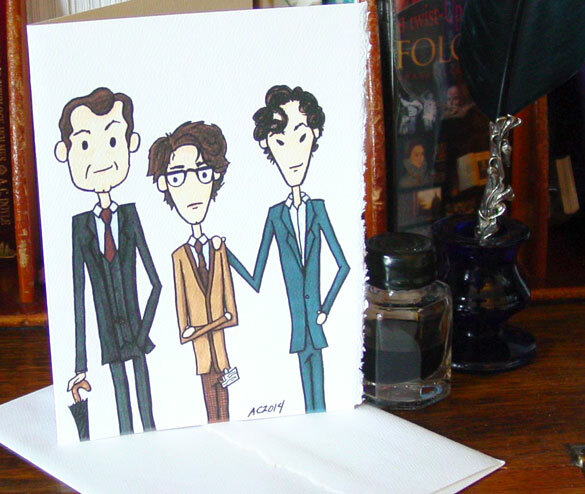 The original was sold in last month’s Floating Gallery, but you can get cards at my Etsy shop, should you so desire. They frame beautifully, or so I’m told. Q. Holmes, 5″x7″ pen & ink and Copic marker on paper. In talking to the person who originally commissioned The Brothers Holmes comics, we found two little snippets from other peoples’ stories that inspired her to ask for me to add a pair of color bonus comics to the series. 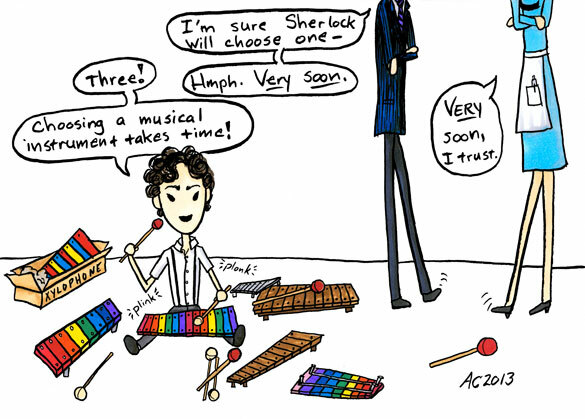 Above, we have a 3-year-old Sherlock in the midst of an obsession with xylophones, and poor Mycroft trying to be all grown up at 10. 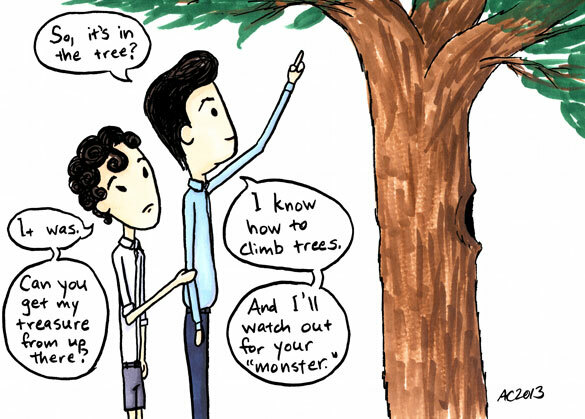 Below, you can see that 8-year-old Sherlock’s heard a Monster in the tree that hides his box of treasures, and he’s relying on his big brother Mycroft, now 15, to rescue his things. 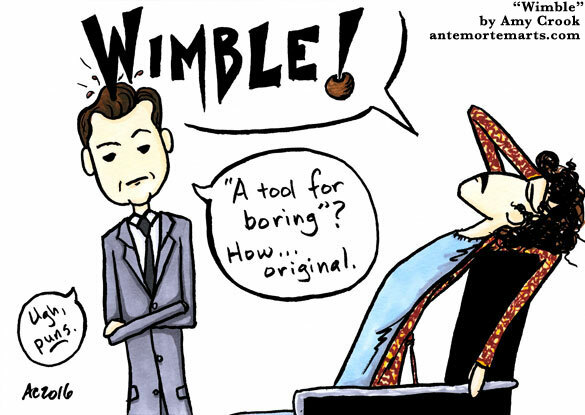 I saw someone posting about Sherlock and Mycroft being originally from Halloweentown in the Nightmare Before Christmas universe, with an older, skeletal brother Sherrinford. I couldn’t resist drawing it up with just a bit of my own silly style added in! 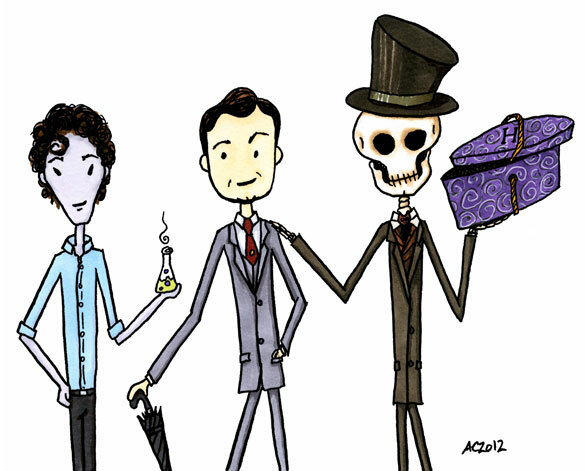 Sherlock’s even dead. Well, undead. Well, you know, Halloweentown. 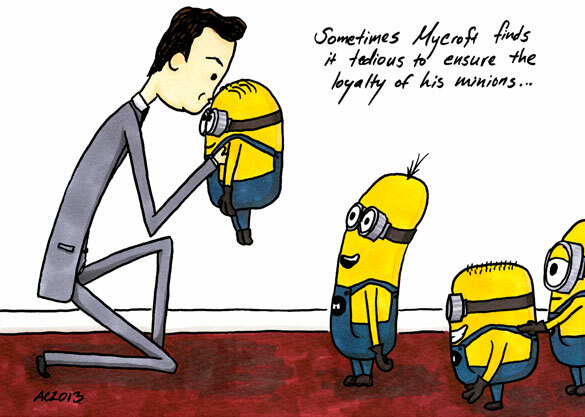 I just couldn’t resist the urge to draw them, given how much my cartooning style owes to Jack Skellington. Sherrinford’s even got a bat for his cravat. 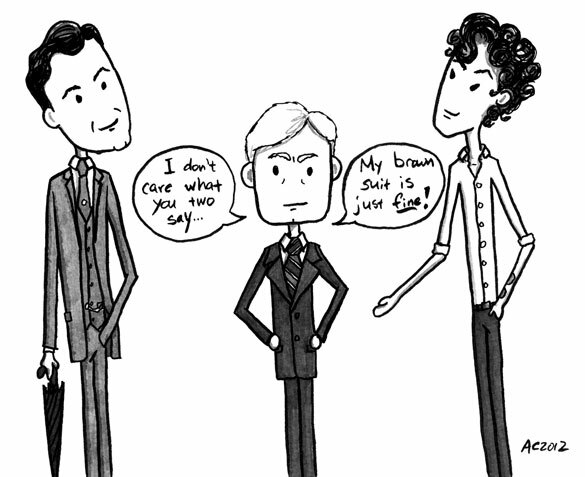 If there’s one thing in the world the Holmes brothers can agree on, it’s that John’s fashion sense is a sartorial crime. I couldn’t imagine doing these comics without John making at least an appearance, and it felt appropriate for his awful brown suit from The Great Game to be the source of a single moment of brotherly accord. And an excellent note on which to end the series! If you’d like, you can read them all over again here. 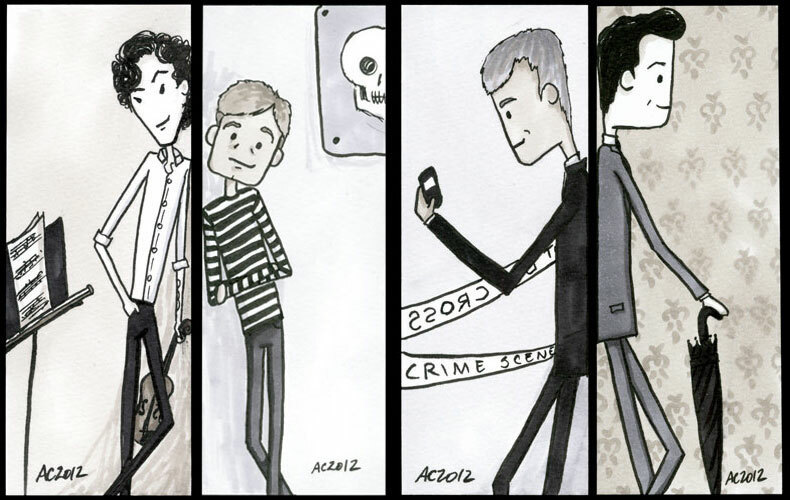 Or, get your very own prints here in the Sherlock section of my Etsy shop. 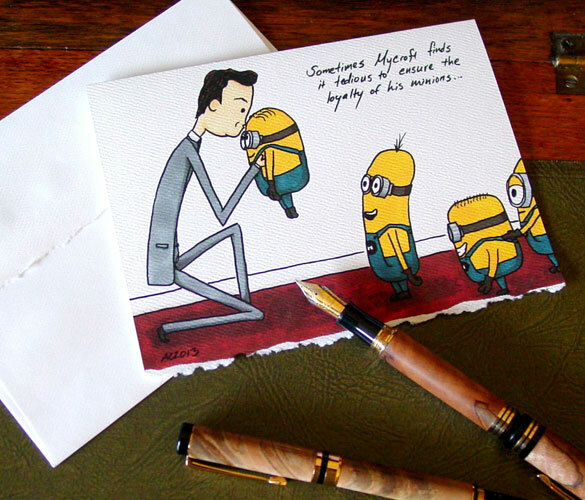 My wonderful patron, Caroline, commissioned the originals, but she’s willing to share!